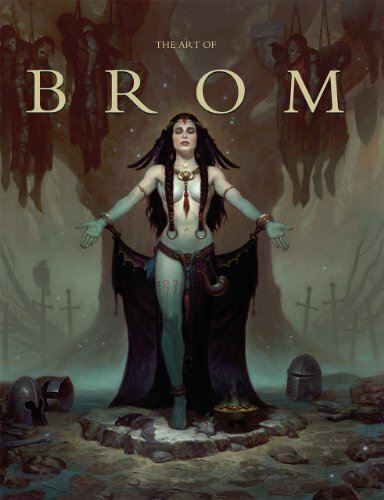 So Brom has finally released an artbook collecting the work from his career. It's a great one. It's a retrospective looking back at his past artworks, from the 90s to the present day. You can see that even back in the early years, his paintings are already quite refined, and he gets better over the years. All the paintings are wonderfully reproduced in high resolution. The bulk of them are printed one of each page in this large hardcover artbook. There are 208 pages so there's easily more than a hundred paintings, all of them character based art in his dark fantasy style. It also includes the paintings from his written books The Child Thief, Plucker and Krampus: The Yule Lord. There are a few pages on his childhood, art schooling days and early career. He also talks about those three written books. I feel that some bits in the middle of the timeline is missing, probably because most of the paintings don't come with additional commentary. Interestingly, this book is from a Kickstarter project in 2012. The target was $12,000 and in the end $235,000 plus was raised with over 2000 plus backers. That says something about how well his work is regarded. It's great that the extra books are selling outside of Kickstarter. The Art of Brom is It's an amazing collection of more than 20 years of work. I have the extended edition of the book and it contains 16 more pages compared to the trade edition. There are sketches + "making of" photos with commentaries about the process of painting Brom practices. As Parka mentioned it there are mostly no commentaries under the paintings. They had listed only the year of creation and the name of the panting. This just leaves me to guess for what projects they were created and loosens my perception of how Brom's style had developed through the years as they are also randomly arranged. Its a very good book non the less. Excellent quality of print and bounding and really inspiring content.